Well, I had every intention of making this a once to twice a week event, but wouldn't you know it our internet was out for over a week. After FINALLY working it out (and Comcast replacing every cable from the pole to my house) I am here with a double treat to make up for the late arrival. 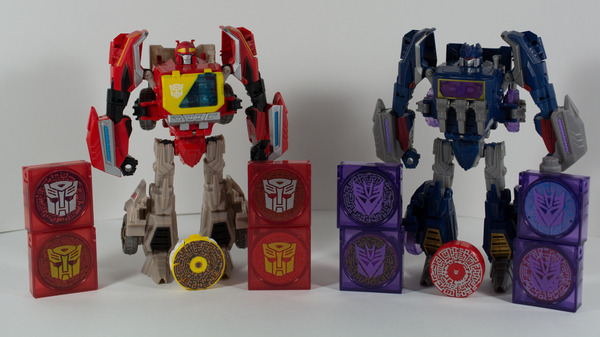 So here you go, Blaster, Soundwave, and all of their "tapes" that were released in 2012 in the Transformers: Generations / Fall of Cybertron set. I do have the third of this set, Soundblaster, but honestly I will be keeping THAT one sealed up tight. Be happy I broke and opened up Blaster and his tapes! Boy do they look great on display though. Soundwave is a larger version of the one released back in 2010 that features the ability to actually store and "launch" the data discs that are the replacement Cybertronian forms for his "tapes" in the G1 series. Blaster showed up for the first time in this set with this figure as a repaint with a remolded head, chest plate, and different weapon.